Kia Motors has once again reinforced its reputation for the highest design standards, picking up two prizes at the 2016 ‘Red Dot Awards' for Product Design, one of the most prestigious international product design competitions. The new Kia Sportage compact SUV and Optima saloon - the carmaker's two latest models - both received coveted ‘Red Dots'. 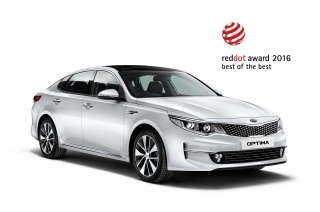 The independent judging panel even honoured the Kia Optima with a ‘Best of the Best' award, the competition's highest distinction, for which only the most ground-breaking designs in a category are eligible. The new generations of the Optima and the European Kia bestseller, the Sportage, were launched across Kia's global markets earlier this year. These new prizes have seen both models defending their Red Dot Awards - both the previous generations of the Kia Sportage and Kia Optima also received Red Dot awards in 2011, while the Optima retains its ‘Best of the Best' prize. Since 2009, when the first-generation Kia Soul won the carmaker's first award in the competition, Kia's design teams have gone on to achieve a total of 15 Red Dot Awards. Now, in 2016, every model in the current Kia product range has a Red Dot. Peter Schreyer, President and Chief Designer of Kia Motors Corporation and Hyundai Motor Group, commented: "Our international design team has every cause to be exceptionally proud of these most recent awards. 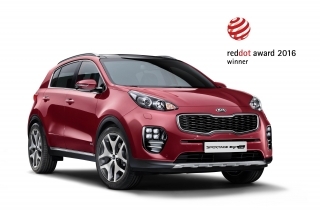 The first Red Dot Awards for the Kia Sportage and the Optima were already great successes. It is a very special achievement to further develop a first-rate, prize-winning model so that the new design also convinces the expert jury of this globally respected and prestigious design competition. "The two award-winners are important models for our brand. The Sportage has been the brand's bestseller in Europe for many years. The Kia Optima, which is one of the strongest selling Kia models worldwide, also embodies the development of brand in a very special way: the third generation, which arrived on the global stage in 2010, acted as the catalyst for the design-led transformation of Kia's product range in the following years. Both the new Kia Sportage and the new Kia Optima stand out very strongly from their rivals in their respective categories on account of the clarity, distinction and sporty elegance of their exterior design. Both cars also feature a completely redesigned, premium-standard interior with modern, horizontally aligned and very ‘clean-looking' design." The all-new Kia Optima was developed by the international Kia design teams in Namyang (Korea), Irvine (California, USA), and Frankfurt (Germany), under the creative direction of Peter Schreyer, who was also responsible for the design of the previous-generation Kia Optima. The 4.86-metre long new model, whose dimensions have been altered only very slightly, features modern surface details, sharply drawn lines and edges, and a longer silhouette, giving it an even bolder on-road presence than its predecessors. This is partly due to the elongated window line, with the addition of a third side window behind the rear door. The characteristic profile with the swept-back A- and C-pillars has been retained, both of which give the model the appearance of a sports sedan. At the rear, the back lights sweep around to the side, giving the Kia Optima a new, modern light signature. The new design of the Kia Sportage was developed under the leadership of the European Kia Design Center in Frankfurt with the support of Kia's Design Centers in Namyang and Irvine. The most striking change to the exterior design is the distinctive new ‘face' of the compact SUV. The headlights, which used to form a visual unit with Kia's signature ‘tiger-nose' grille are now noticeably separate from the grille, making the front view broader and more stable. The compact SUV has retained its characteristic profile, and the side view - partly due to the 40 mm longer body, at 4.48 metres - is now even more dynamic in its design. The new ‘GT Line' model presents a sportier appearance, with a number of exclusive design elements, including a redesigned grille, ‘ice cube'-style fog lamps, under-body cladding at the front and rear, and twin exhaust tailpipes. Both models are available with highly efficient petrol and diesel engines, and can be ordered with state-of-the-art assistance systems - including Autonomous Emergency Braking with pedestrian recognition. In the European safety test Euro NCAP, both models received the highest rating of five stars. The ‘Red Dot Design Award', one of the world's most prestigious design competitions, is divided into the three disciplines: Product Design, Communication Design and Design Concept. For the 2016 Red Dot Awards, companies from 57 countries registered 5,214 products and innovations. The competition, which has been held since 1955 by the Design Centre of North Rhine-Westphalia, attaches great importance to the impartiality of its high-calibre jury. To avoid any bias, none of the jury members may be an employee of the manufacturing industry. This year the ‘Red Dot' jury was larger than ever: The 41 experts from all over the world - freelance designers, design professors and trade journalists - included Chris Bangle, Jimmy Choo, Professor Lutz Fügener, Hideshi Hamaguchi, Kristiina Lassus, Raj Nandan, and Ken Okuyama.